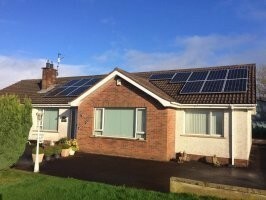 The system will generate electricity as well as a tax free income and savings of approximately £1,100 pa.
BlueBuild Energy concentrate on providing the highest quality product with the highest return on investment for our customers who will get a better return than any other PV Solar system in Northern Ireland and considerably better than money in a bank or building society. Bluebuild Energy use German manufactured panels by Antaris who have been established for over 30 years with over 10 million customers. Antaris have the longest guarantee of any panel in the UK. The winner will be selected at random when we reach 2500 likes. The sooner we get to 2500 likes the sooner the prize winner will be selected. 20 runners up will receive a voucher worth £200 towards a PV Solar order with BlueBuild Energy. 1. Employees of BlueBuild Energy or their family members or anyone else connected in any way with the competition or helping to set up the competition shall not be permitted to enter the competition. 3. No responsibility can be accepted for entries not received for whatever reason. 4. The promoter reserves the right to cancel or amend the competition and these terms and conditions without notice in the event of a catastrophe, war, civil or military disturbance, act of God or any actual or anticipated breach of any applicable law or regulation or any other event outside of the promoter’s control. Any changes to the competition will be notified to entrants as soon as possible by the promoter. 5. The promoter is not responsible for inaccurate prize details supplied to any entrant by any third party connected with this competition. 6. No cash alternative to the prizes will be offered. The prizes are not transferable. Prizes are subject to availability and we reserve the right to substitute any prize with another of equivalent value without giving notice. 7. Winners will be chosen at random when the BlueBuild Energy Ltd facebook page reaches 2500 likes. 8. Winner must be a homeowner and a resident in Northern Ireland.